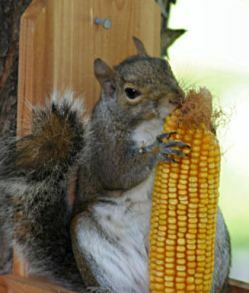 National Squirrel Appreciation Day | Faddegon's Nursery, Inc.
For those who adore and embrace these furry little creatures, you can treat them to sweet corn squirrel logs. These one pound logs, made of sweet corn flour, are equivalent to 12 to 24 ears of corn. The package comes with a hanger and heavy duty screw assembly. If you want to be further entertained, then purchase the Squirrel Kob Bungee by Birdol. This contraption, featuring a dangling bungee cord attached to a corn log, guarantees hours of comical antics. If you’re on the side that believes squirrels are four-legged, destructive rodents then you’ll want to reach for products like Shake-Away, Repels-All, and Shot-Gun Hot Pepper Wax Animal Repellent. We carry all of the above (except squirrels) at our nursery.